Having scored one and made the other, young Cesc Fabregas will deservedly take all the headlines, as the Spanish starlet absolutely bossed the midfield tonight. But all over the pitch our players deserve the plaudits for such a masterful display. For our first goal I had to do a double take. Was that really Robert Pires who produced such a crucial intervention in the middle of the park? I was flabbergasted to see Bobbie robbing Vieira of the ball with a perfectly timed tackle. Call me a cynic, but I can't help noticing that Le Bob appears to be a different player, ever since he's had something to fight for (ie. to prove himself worthy of more than just a one year extension). Alternatively, if he should appear slightly less enthusiastic against Villa this weekend, then perhaps he's just trying to put himself in the shop window, in games where he knows the rest of the world is watching. Whatever the case, or the motivation, it was wonderful to see the influential Pires of old appear this evening. Perhaps I'm slightly biased towards the defence, due to the fact that I played as a left-back in my youth. But I've been a bag of nerves all season long, grabbing for Róna's hand every time any opponent attacked our back line because we've looked so shaky and dreadfully vulnerable. I'm not sure whether we can pinpoint the Madrid game as a turning point, or whether it's been a more gradual process. However it's evident since we encountered Real that there's a belief now present in this inexperienced back line that seems to blossom with every game. Before tonight's match I would've expected someone with the tactical nous of Capello, the Juve manager, to have targeted us down our left flank and perhaps Mathieu Flamini had a similar thought, as almost from the first whistle our French full-back threw himself into the fray, with the sort of wholehearted commitment which was guaranteed to put the wind up the opposition. He was tackling anyone who dared venture down his flank, with a forcefulness which made me shudder all the way over in the West Upper and he stamped his 100 per cent committed personality on the game with an enthusiasm that almost guaranteed himself a relatively easy evening. What's more the Juve player's relative reluctance to be clattered by one of Mathieu's "ball and man" boneshakers ensured that our French stand-in at left back found license to maraud down Juve's right flank, overlapping Reyes, taking defenders with him to leave the Spaniard with more room. Flamini's performance would've stood out for me, just for the way he set the tone with his first couple of challenges, if it wasn't for the fact that his three other team mates in our back line also produced incredibly flawless displays. Again Manny Eboué was unbelievably impressive, both for his strength and speed and for a maturity of performance far beyond his years (considering this youngster only made his first team debut a couple of months back). Meanwhile Kolo and Phillipe Senderos were also absolutely peerless, with Phillipe not even offering Juve a sniff by managing to avoid one of his almost customary gaffes. Having walked back home...sorry floated back home from Highbury, on the sort of high which meant I arrived at the front door to our first floor flat without having to negotiate the stairs, I promptly sat down to watch the recording of the ITV coverage on our Sky Plus gadget, without even taking off my coat, something I haven't done in many a moon. As a former manager of our neighbourhood foe, I know we are supposed to hate the kerb crawling lech in the commentary box, but I'm afraid David Pleat is one of the few TV pundits whose comments I often find myself agreeing with. However it really got my goat to hear the main ITV commentator moan about the Italians poor performance. Believe me, walking away with Serie A, eight points ahead of their nearest rivals, Juve are no pushover and the fact of the matter was that we simply did not let them play! It was the same story after we beat Real Madrid. My Spurs pals were responding to my queries about whether I missed anything on the episode of Eastenders that night, by reminding me that "Madrid played really crap" but in truth both Juve and Real were only able to perform as well as we allowed them to play and it really winds me up that in defending as a team, the amount of credit we receive is limited in any way by the ineffectiveness of the opposition. 1-0 up at half-time, I came out with the customary "can we go home now?" as I was terrified that having secured the lead just before the break, we might spend the entire second half soaking up pressure by sitting too deep. It would've proved an extremely long 45 minutes if we'd done that and the fact of the matter is that we are just not the sort of team which is designed for setting out with the sole objective of maintaining a clean sheet. If Patrick Vieira had returned to Highbury with Juve, to play the Arsenal team of only a couple of months back, it would've proved an entirely different encounter, with the Italian champions capitalisiing on our insecurity and lack of believe. Whereas it was evident from the first minute of this match that we were more than capable of mixing it with the very best European football has to offer. In fact, as far as I was concerned it was a measure of how consummate a performance this was, that we were total masters of our own destiny. When we came out for the second half, my greatest fear was the possibility of shooting ourselves in the foot, with the one momentary lapse in concentration that is all a team like Juve needs to profit from. However it was evident quite how brilliantly Senderos, Kolo, Manny and Flamini performed all night that they saw off Trezeguet long before the end. I can hardly recall the powerful French striker getting a touch the entire ninety! What's more Juve's frustration and the feeling of being so dominated was something so far beyond their experience, that this manifested itself in the two utterly stupid and senseless acts that got Camoranese and Zebina sent off at the death. Another ten minutes and we might've buried them completely and even a supreme pessimist like myself is pretty hopeful that we'll go to Turin with such a psychological advantage, that Juve might struggle to pick themselves up. We saw this evening from their body language towards the end of the game that they were a roundly beaten side, as their heads had dropped and they were flagging physically. I wondered whether the weekend off for our lot would prove an advantage or not. But when you saw how full of running we were, then I guess I needn't have been concerned, as it would seem that without the release of 90 minutes of football on Saturday, the coils of the Arsenal's overwound clocks were perfectly tuned to spring into action by the ultimate watchmaker, Arsène Wenger. 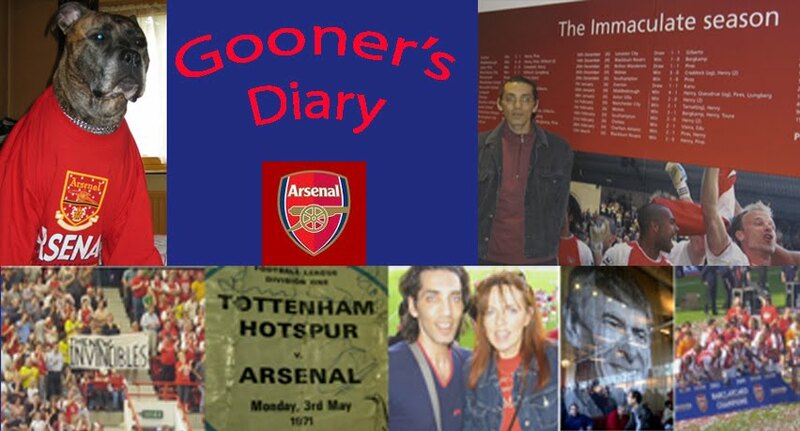 As we walked back down Conewood Street, past the Gooners celebrating outside the Gunners pub, Ró commented that she sensed the sort of satisfaction we used to feel from the old fashioned "1-0 to the Arsenal" type victories of George Graham's better sides. I knew what she meant, but it was even more amazing than that, as in addition to that incredibly secure "they shall not pass" feeling, there was the additional confidence of knowing we could cut a swathe through the Italian champs, almost at will. There were a couple of instances in the second half when Thierry Henry was idling with the ball just below us, in his favoured position out on the left flank, before tapping it down the line and turning on the after burners, to leave his opponent/s for dead. Juve were only saved by the defender dashing out from the middle to put the ball into touch. As charming and as gracious a geezer as Titi is, you get the feeling that he's so aware of his own pace and talent, that he just can't help taking the piss. And no matter how many times I see him waste defenders, I could never tire of watching Thierry. He manages to take my breath away absolutely every single time. It's something to do with the air of effortless, animalistic ease of Titi at full pelt, which makes him such a pleasure to watch and sets him above all the other footballing greats. The good thing about us going into the return leg two goals up, is that unlike a single goal advantage, where Juve could bide their time and patiently wait for the almost inevitable opening, at the Stadio Delle Alpi next week, they are going to have to go for us. And on the wide expanses of Juve's pitch, they will undoubtedly leave themselves open to our counter-attacking conquests. If we can shut them out for the first 15 minutes - I was going to say "silence the crowd" but I imagine after tonight, their cavernous stadium will be even more empty than usual - I have a feeling that their heads might soon begin to drop and so long as they don't get that glimmer of hope from an early goal, it could be another great European night. In my humble opinion, absolutely the only thing that let us down tonight was the sound of some Gooner ingrates giving Patrick Vieira the bird. I can't remember the exact figures but in Arsène's pre-match conference, he spoke about how Paddy's nine years at THOF was the equivalent to something like 40 or 50 years of a career in any other warp of life. We should remember that although we suffered over the course of several summers, with all the will he/won't he sagas, at the end of the day Paddy didn't depart Highbury out of choice, he was sold by the club. And from what I've been led to believe, he was more than a little shocked at the way it worked out, in as much as he wasn't expecting the club to cash in on him. We received £13 million for a player, who some say has somewhat knackered knees and as a result isn't likely to be able to play out a full season for his new club. If his body is on the verge of breaking down, it reached this state securing more silverware than most Gooners have seen at Highbury and more's the point, playing the sort of entertaining football that many of us who are longer in the tooth, never in our wildest dreams imagined we'd be enjoying week to week at THOF. Unfortunately with my dreadful memory, I can't recall the exact circumstances, but I do remember a previous visit to play Juve which was a real wet blanket, where the Italians didn't bother to turn out to watch a virtual reserve team including hardly any of their star names and the Gooners in our section of the ground were more interested in knowing what was going on in the other group game being played that night, as I seem to recall, we needed an extremely unlikely result in this other match to have any hope of qualifying. To be honest I can't imagine next week's match at this soulless venue is going to be much more atmospheric. However I sincerely hope that in at least one corner of this concrete monstrosity the “craic” will be up to 90! Hi,I sometimes check your blog,but to be honest,I've never been able to finish reading even one of your posts.